A (sponsored) article today in the Northumberland News attempts to explain the difference between “retirement residences” and “nursing homes”. It suggests that some people are confused, and might shy away from moving to a retirement residence because they equate it with a nursing home. It boils down to independence, the piece explains, with retirement residences allowing you to live in private and semi-private accommodations, with light housekeeping and meals provided. Long-term-care facilities, on the other hand, offer 24-hour nursing care and supervision among other services for those who are no longer willing or able to live independently. This is a fairly reductive take on the subject. 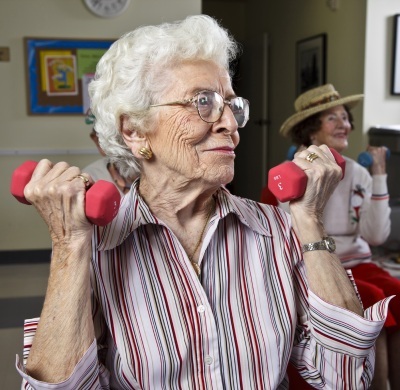 The article doesn’t explore the options available for those in early retirement – such as fully independent living within a retirement community. And finally, there’s a new concept of retirement living which combines all three of these scenarios into something much richer. That’s the concept behind Meaford Haven, which makes it a “Three-Seasons Community™”. At Meaford Haven, you can choose the accommodation and lifestyle that suits you. 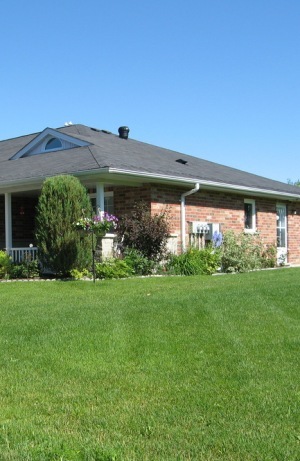 In your early retirement years, you can live independently in a comfortable, manageable bungalow; with outdoor chores crossed off your list, you have plenty of time to explore and engage in all that Meaford and the Georgian Bay area has to offer. Or you can choose the mid-rise condominiums and apartments, which provide a greater level of security and service. And then there’s our full care accommodations. 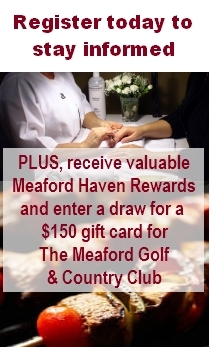 With all of these different facilities situated in one community, Meaford Haven is greater than the sum of its parts. As you decide you’re ready for a more structured environment, you can move without leaving behind your friends, the places you’ve grown to love and the community you’ve become part of. By downsizing their homes, 50+ retirees in Ontario are looking to reduce year-round maintenance, lowering their cost of living, opening up opportunities to travel, and otherwise help finance their retirement. That’s the word from a new market research survey conducted by Angus Reid, which found that 60 percent of those surveyed (Ontario homeowners 50 years old and up) plan to sell their existing homes and buy or rent smaller homes sometime during the next five years. The survey also suggests that most of these folks (53 percent) don’t want to live in a highrise apartment or condo block. And nearly 80 percent see this as their last big move – so they’re looking for a community that will continue to serve their needs for years to come. This suggests that a lot of Ontario people preparing for retirement are searching for a place that will offer an active lifestyle in a true neighourhood setting, with the opportunity to age in place and maintain their independence well into the future. The margin of error—which measures sampling variability—is +/- 4.4 percentage points, 19 times out of 20. The results have been statistically weighted according to age, gender and region. Discrepancies in or between totals are due to rounding. One more historic home to add to our recent collection. Came into possession of this recently… a custom postcard dated from 1907 from H. C.(?) Knight. Have yet to research where Mr. Knight fits into the Knight dynasty in Meaford, but will follow up. His grand home, recently built at the time he sent the card, still stands at the corner of Berry and Cook Streets. The porch and balcony railing were as yet uncompleted when the earlier photo was taken. 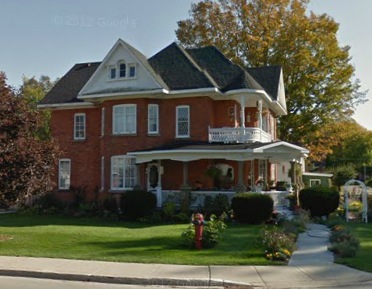 In the recent shot from Google Streetview, you can see that the home, like many in historic Meaford, has been lovingly maintained. 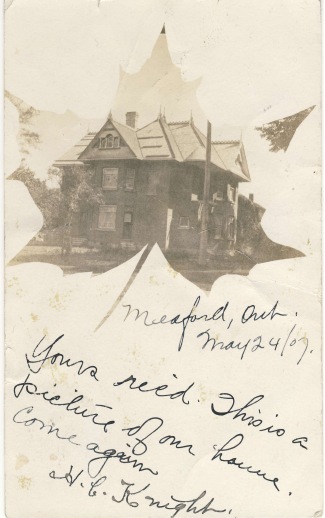 Mr. Knight sent the postcard to Mr. Harry H. Bent in Belleisle, Nova Scotia. One of the first things you notice when you drive into Meaford is the large number of historical buildings on the main street. Meaford is currently in the process of designating a large section of downtown as a Heritage Conservation District. Here’s a bit of background on just a few of the buildings you’ll as you explore the town. At the southeast corner of Trowbridge and Cook Streets you’ll find the Cleland-Clarke house. 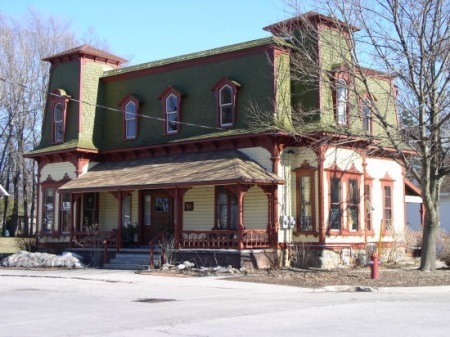 It was built in the late 1870s by James Cleland, who was Reeve of Meaford at the time and later became Mayor. In 1889 Dr. John G. Clarke bought the house, and lived there till his death in 1930. 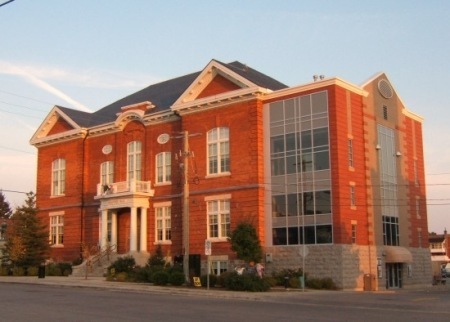 More recently it has been home to Meaford’s 100 Mile Market, and currently offers apartments and a retail space. The original hitching post remains in front of the building. 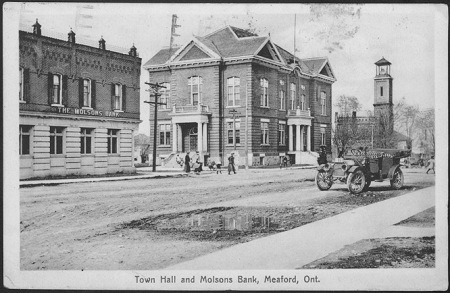 The building housed the council chambers (which doubled as a courtroom), town offices, two small jail cells, and the Meaford Public Library. Farmers used the basement on market day, and in time this space served as ballroom, meeting area, and Boy Scout hall. Later divided into smaller rooms, it housed the Women’s Institute, the Meaford Quilters, a Senior Citizen’s club, and the Senior Men’s Euchre Club. The second-floor Opera House featured a broad stage beneath a proscenium arch, rows of wooden seats (fitted with wire racks for gentlemen’s hats), and a balcony embellished with raised plasterwork acanthus leaves. 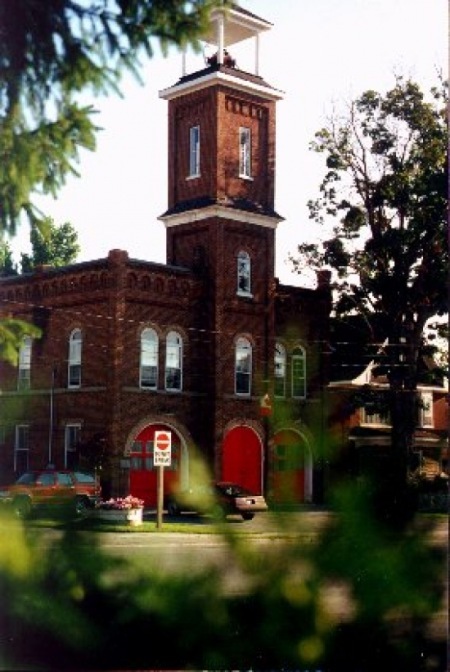 It played host to travelling entertainers, the Meaford Citizens Band, live theatre, and local events in a theatre known for its exceptional acoustics. In the last decade, the building has been magnificently restored, with a modern addition to house elevators and additional rooms built in a style that echoes the original. From “Ontario Towns”, by Ralph Greenhill, Ken Macpherson, Douglas Richardson. Published by Oberon. Service Canada has a calculator which provides you with retirement income information, including OAS and CPP benefits. It takes about 30 minutes to work through the series of modules, at which point you’ll discover how your retirement income stacks up against the 70 percent income replacement rate a lot of planners recommend. A separate calculator helps you understand how contributions to the new Post Retirement Benefit (PRB) can contribute to your financial security. If you’re debating the benefits of a Tax Free Savings Account (TFSA) over a Registered Retirement Savings Plan (RRSP), here’s help. By filling out a few fields, you’ll get a good idea of whether you’ll be bettter off with contributing more to a TFSA or an RRSP now. While you might approach it with a little trepidation, this calculator can give you a rough idea of how much you’ll need to have in retirement based on your genes, your health and your lifestyle. Choose from a number of mortgage calculators using the right-hand drop-down. There’s a tool for planning every stage of homeownership and mortgage renewing. Last month we presented some of the findings from a major market study commissioned by Meaford Haven. Affordable housing in a high demand area and Meaford Haven’s progress on the development path, with Draft Plan of Subdivision approval, positions the retirement community as a prime location. A lot of baby boomers have discovered a new hobby – shopping around for retirement communities that fit their future plans. So when N. Barry Lyon Consultants Limited undertook a major market study commissioned by Meaford Haven, they took into account the rural and urban areas of Meaford, as well as the Town of The Blue Mountains (Thornbury and surrounding area), Collingwood and Owen Sound. The neighbouring municipalities acted as benchmarks, recognizing that those people searching for retirement communities would compare housing options, including pricing, sizing, location and level of amenities nearby. At the time of the study, 25 projects, comprising 3,726 units were under application in the area.. Many of these consisted largely of traditional and bungalow townhomes, but only six included condominium apartment buildings. Meaford itself accounted for 45 percent of the total proposed units, a large amount compared to its current share of the market. Municipal planning staff suggest that the development community is discovering Meaford. The twist is affordable housing. Many of the developments proposed, including a large one outside of urban Meaford, are aimed at an affluent market, including people looking for seasonal homes, with larger units and higher pricing. By contrast, Meaford Haven is looking at retirees and pre-retirees who are “right sizing”, and it plans to keep prices affordable. As well, Meaford Haven is much further along in the development process than the other major proposed Meaford development, with Draft Plan of Subdivision approved. Across the study area, despite all being within a 25 minute driving distance, there is a tremendous range of unit pricing in the study area. Pricing ranges from $239,900 for a 985 sq. ft. for a bungalow townhome ($244 psf) at Gates of Kent in Meaford, by Reid’s Heritage Homes, or $239,900 for a 1,458 sq. ft. traditional townhome in the urban fringe of Collingwood at Tanglewood, by Sierra Group, to $699,900 for a 2,903 sq. ft. home ($241 psf) in The Blue Mountains at the Lora Bay master planned community, by Reid’s Heritage Homes. In recent years, there have been homes as high as $1.2 million for a 3,759 sq. ft. townhome ($319 psf); however, such higher priced housing appears to no longer be available, perhaps indicating a slight softening of the luxury home market. The majority of the vacant lot subdivisions, due to their location, exclusivity, and available lot sizes, have much higher land values than typical housing developments in the area. As a result, such subdivisions, once built upon, would constitute the high end of the price range in the study area. For example, The Birches of Georgian has serviced lots as high as $259,900, Peaks Bay in Camperdown has lots priced as high as $599,900, and Windrose Valley (actually located in Clearview Township directly abutting the Craigleith area) has five completed model homes on lots priced as high as $2.25 million. All of the above indicates that many potential buyers, including younger and older seniors, looking to purchase in the area will be priced out of The Blue Mountains. On an overall basis, the less expensive homes in the study area are located in Meaford and Collingwood. Typical entry-level pricing for new housing in Meaford is roughly $75,000 lower than projects in Collingwood and $220,000 lower than projects in The Blue Mountains. a 2,903 sq. ft. unit ($241 psf) in Lora Bay. bungalows or traditional two to three storey units. Townhomes in the study area range from $239,900 for a 985 sq. ft. unit ($244 psf) in Meaford, to $579,900 for a 3,318 sq. ft. unit ($175 psf) in Thornbury. Semi-detached units, of which there are four developments in the study area, range from $259,990 for a 1,040 sq. ft. unit ($250 psf) in Collingwood’s new urban area, to $599,900 for a 2,343 sq. ft. unit ($241 psf) in Craigleith. More from the study next time. Last month we looked at the history of Meaford Haven – revealing how a chance drive through Meaford inspired Toronto developer Pierre Boiron to begin work on a unique Three Seasons retirement community. From the beginning the project caught the attention of people looking for a friendly, small-town Ontario retirement community, and Boiron has received a lot of interest from potential residents. Now, as the project has achieved a number of important steps and cleared numerous hurdles on the way from dream to developed community, folks keep asking, “When can I move in?” To help answer that question, here’s a behind-the-scenes look at how a major development such as Meaford Haven progresses. When Pierre committed to moving forward with Meaford Haven, he planned to take all the necessary steps to prepare the property for construction. Then, he’d sell the new subdivision (including the market research, the vision and guidelines to achieve it) to a builder who would actually build and sell the bungalows, condominium apartments, and other buildings in the retirement community. As the very first step, Pierre made an offer on the land, conditional on successfully getting approval on a draft plan of subdivision from the Municipality of Meaford. 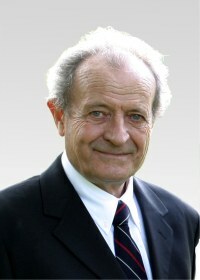 After nearly three years of painstaking work creating a vision for the community, laying out the neighbourhood, retaining various consultants and engineers, listening to nearby residents and the many stakeholders in the region (including the County and conservation authorities), and satisfying all demands, Meaford Haven had its draft plan of subdivision approved. The sale of the property concluded and Boiron took over the property. A Draft Plan of Subdivision comes with a list of conditions of approval that must be approved before construction gets underway. Conditions include such items as installing roads, water, sewers (sanitary and storm), providing utilities, telephone and cable to each lot, and posting of security (usually in the form of letters of credit from a bank.) At this stage, Boiron had the option of satisfying these conditions and selling the lots to a builder, or selling the land as is. As originally planned, it was time to seriously seek out interested builders. During the period Meaford Haven was taking the steps to get the Draft Plan of Subdivision approved, Boiron was also working hard to market the community to potential buyers – a big added value for the builder. The builder is not only getting a property ready for development but it comes complete with a vision, market research, recommendations and choices for home styles and amenities. And the Meaford Haven development team plans to assist the builder as much as possible in implementing these, insisting on high standards for the community. A website directed specifically at builders, www.meafordhavenforsale.com, presents details on the development to date, including development charges, and offers for sale the residential development blocks and, separately, the retirement residence block. The website points out numerous advantages of the site, the location, the concept and the demand, saying some nice things about Meaford in the process. It also addresses the potential obstacle of Meaford’s low absorption rate – the yearly number of new homes sold in a community. A builder’s Number One interest is how many units might he sell in a year. Meaford currently issues 40-50 new home building permits a year, so a builder might conclude he could only sell 15 or 20 homes a year. Meaford Haven’s take on this relies on its market research and the careful development of the concept for the retirement community: with the right product in place, the demand will increase. Boiron is currently speaking to a few builders interested in the Meaford Haven concept and hopes to strike a deal (or deals) before long. The options are many. One builder might buy all the residential blocks, including the retirement residence, leaving Boiron to develop the commercial/medical centre. A builder may buy only the residential sites for the cluster bungalows and low-rise condominiums, and a retirement residence specialist would buy that block. Different builders might purchase different residential blocks. Another option might see Boiron entering into a joint venture with a builder or builders, providing the land as collateral. Builders can find this arrangement attractive as it makes financing easier. So, there are lots of ways to take the next steps with Meaford Haven, but from the standpoint of the new resident in the community, the end result is the same: a beautiful new home in a small town retirement community where you can age in place, staying in the neighbourhood you’ve grown to love with the people you’ve come to know.